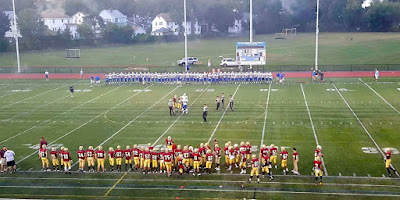 The Leominster Blue Devils bested the Doherty Highlanders 28-20 Friday night in an exciting battle that featured its fair share of big plays. Although Leominster never relinquished the lead, it was a hard fought, back-and-forth struggle that took place inside Worcester's Foley Stadium. Of the seven touchdowns scored in the game, three of them were from 45 or more yards out. Tajon Vasser of Doherty had a 76-yard kick return for a touchdown in the first quarter. Then, in the third quarter, Highlander Quarterback Chris Schoen connected with teammate J.J. Early, who turned on the jets for a 50-yard score. Leominster saw their own big offensive score in the fourth quarter when sophomore Adam Couch absolutely exploded through the line and shook off a pair of tackles to find his way to the end zone. In addition, each team also had a score of 20 yards. Leominster’s Noah Grey connected with fellow captain, fullback Anthony Dandini for a pretty touchdown. Doherty’s Mike Oppong also scrambled around the backfield for a bit until finding the right side, and no one would deny him six points. It’s worth noting however, that despite these big plays, both defenses played well. Neither allowed the opposing offense to get into a real rhythm. Doherty played Leominster tight for three quarters, before the Blue Devils were able to finally pull away in the fourth. However, it was clear that Doherty never gave in. With a minute left in the game, in place of taking a knee and the loss, they chose to work for one last touchdown despite victory being out of reach. This is the Doherty team I anticipate seeing the rest of the season. They displayed a lot of heart. That spirit will definitely push them over the hump in some close games down the stretch this season. 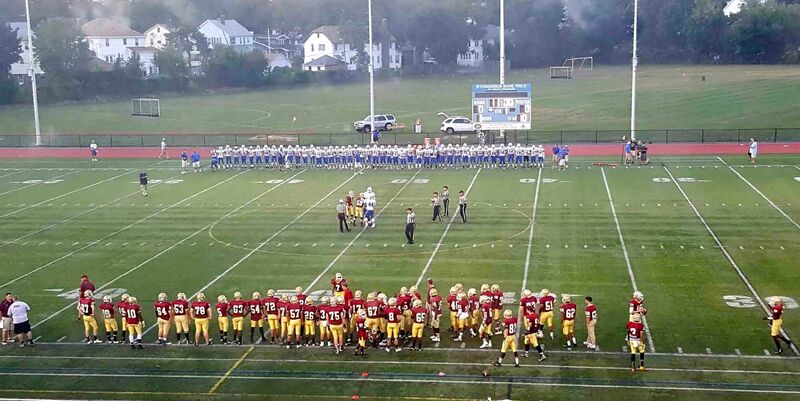 After the game, Doherty head coach Sean Mulcahy reflected on his team's heart. Doherty will work to polish up some mistakes from week one and take this loss as an opportunity for team growth. On the Leominster side, it was clear that, while the win was encouraging, it was by no means satisfactory. The team’s captains and coach both expressed that a win is a win, and that’s a great thing, but they know this team can play better. Too many mistakes on both sides of the ball for their standards. On the bright side though, Leominster showed how resilient they can be and how deep their talent goes. Duke-bound quarterback Noah Grey would later echo his fellow captain’s words. Leominster's depth was evident in the way the team carried itself. It was evident in the way players came off the bench ready to make plays. Mike Viola showed it when he, a third string cornerback, stepped on the field and had a big interception in the third quarter. Head coach Dave Palazzi has his reserves ready. It’s clear that Leominster has enough guys that want to go lay it on the line for their “brothers,” as Grey would refer to them. But for now it’s back to the film room for the Blue Devils, as they look to iron out the mistakes from the first game of the season. Leominster will be back on the field next Friday at Oakmont, while Doherty will look to get its first win at home against cross-town rival Holy Name.